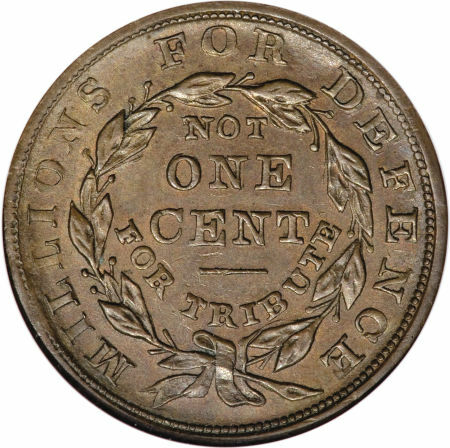 Liberty - Not One Cent. 1837. Copper. 27.2mm. 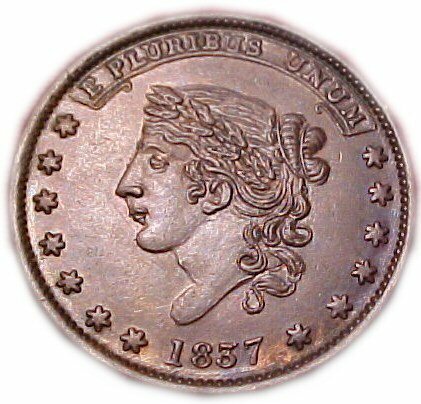 This variety lacks the obverse legend E PLURIBUS UNUM, which is present on HT-38 through HT-52. The small date and narrow bust truncation further distinguish HT-35. The Madision Collection (Heritage Auction Galleries, February 14, 2008, lot 81317). Ex. John J. Ford, Jr. Collection, Part 4 (Stack's, June 2004, lot 70). Ex: F.C.C. Boyd estate. 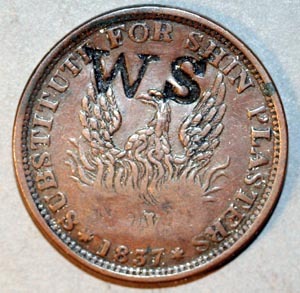 Equivalent strike and conditionto the Rulau Sixth Edition plate coin. This particular issue is very scarce above VF. Steve Hayden: "I only have records of seven higher grade examples in my database." Steve Hayden Mail Bid Sale #21, May 22, 2004, lot 620. A bit on the dark side, as usual. Struck on thick planchet, but with relatively smooth surfaces. Pedigreed by Donald Miller to the Hetrich Collection. The Charles Litman Collection, PCAC sale #72, December 6, 2003, lot 31. Granular with traces of old oxidation on the surfaces. 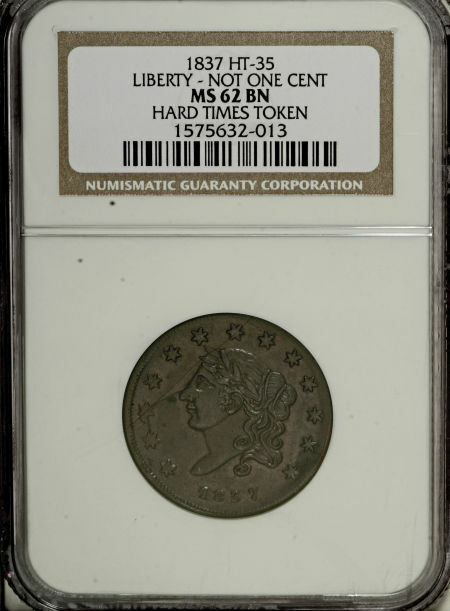 Some examples of Low 27 are overstruck on large cents or other Hard Times Tokens. This one, pedigreed by Donald Miller to the Hetrich Collection, is not. The Charles Litman Collection, PCAC sale #72, December 6, 2003, lot 32. Liberty - Not One Cent. 1837. Copper. 28mm. The wreath has six berries outside, seven inside. Nice olive brown toning overall. Rare in this high grade. Stack's April 15, 1992 sale lot 3583. Liberty - Not One Cent. 1837. Copper. 28mm. Chin & point of bust short; curl on below neck, both terminate left, the latter above 37. 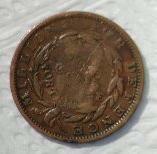 A lovely brown uncirculated specimen. Superior to the John J. Ford specimen sold on June 23, 2004. The Charles Litman Collection, PCAC sale #72, December 6, 2003, lot 34. Probably Ex. Donald Miller Collection. 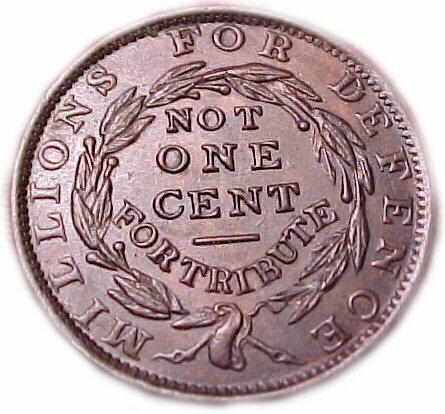 NOT ONE CENT. Millions for Defense. 1837. Bronze. 28.1mm. Nose sharp; point above 1 in date; lowest horizontal (only instance) with curl terminating right; above 7; end of scroll beneath second U in UNUM. About Uncirculated. Brown toning overall. A sharp, well struck coin. Obv: Two small black spots are in the field at the left of Liberty's mouth. 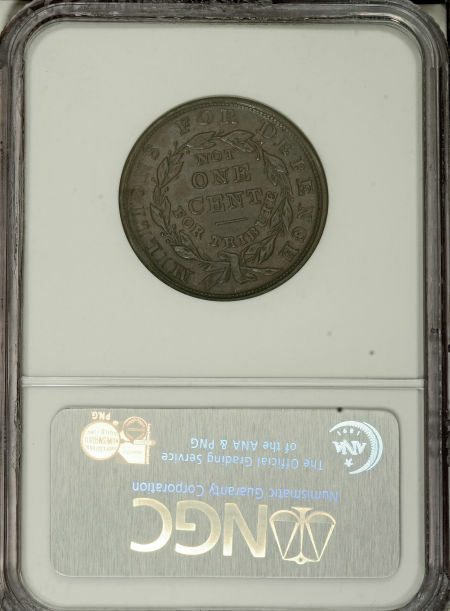 "3" struck over "5" in "1837". Many do not recognize HT 46R as a separate variety, rather a later stage of striking. The "3" is less filled than most of this variety, further confirming that the plugged "3" is a progressive die degradation. The Sara Hinckley Collection of Hard Times Tokens, PCAC Exonumia Auction #76, November 11, 2006, lot 190. Liberty - Not One Cent. 1837/57. Copper. 28.1mm. UNLISTED. H*H counterstamp on obverse. Obv: A number of thin scratches traverse the surface in different directions. Rev: A number of thin scratches traverse the surface in different directions. Liberty - Not One Cent. 1837/57. Copper. 28mm. Curl on and below neck, both terminate at left; end of scroll under N in UNUM, which is double-cut at bottom. Liberty - Not One Cent. 1837. Copper. 28mm. Curl on and below neck, both terminate at left; end of scroll under N in UNUM, which is double-cut at bottom. The wreath has five berries inside, three outside (one opposite second E in DEFENCE). Very well struck with nearly flawless fields. Liberty - Not One Cent. 1837. Copper. 28mm. No obvious letter distortion, though worn. As reverse of HT 47. Right stems as original. Tan with hints of aqua, red and gold toning. Some cartwheel under lovely satin surfaces. 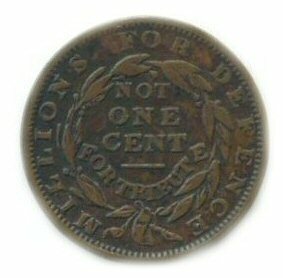 Liberty - Not One Cent. 1837. Copper. 28mm. Retouched die. Stemps recut at certain points. Die failing at ILL of MILLIONS. Dot after E of TRIBUTE almost disappeared. Mostly brown with a few scattered traces of mint color. Light marks only. The John J. Ford Collection (Stack's, June 23, 2004, lot 90). 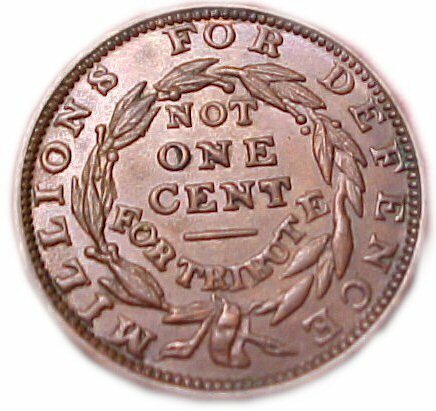 Liberty - Not One Cent. (1840). Copper. 28mm. The wreath has six berries inside, two outside. Nice uniform milk chocolate color. Needle sharp strike. Liberty-Oak Leaves, Not One Cent. 1837. Copper. 28mm. All tokens HT 45 thru HT 52 were struck by Scovill in Waterbury, Conn. Deep brownish red with some darker spots, small deposits. 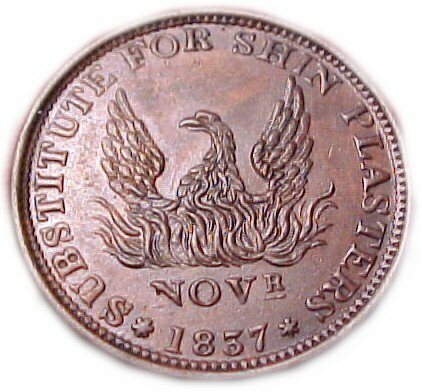 Extremely rare, struck for Charles Ira Bushnell, pioneer cataloguer of Hard Times Tokens. Stacks: "We note only four auction records in the past 50 years. It is doubtful more than 6 are known." Stack's January 21, 2003 sale, lot 1248. Ex. Griner Collection (Bowers & Marena, March 1989). Ex. Garrett Collection Part II (Bowers & Ruddy Galleries, March 26 & 27, 1980, lot 1129). Millions For Defense - Not One Cent. 1837. Copper. 28.5mm. Bushnell Fantasy. Wreath has three berries outside, six inside. Splendid brown toning overall with much fading red. 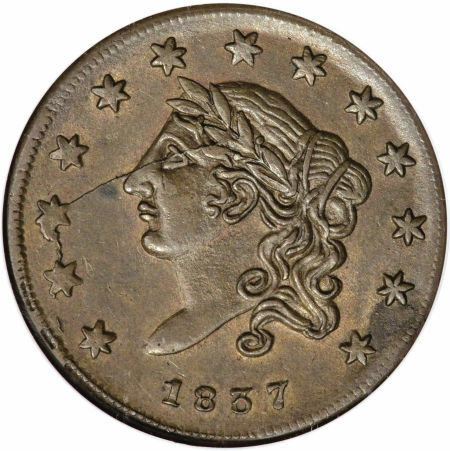 Stack's Americana sale, January 15-17, 2002, lot 561. Bushnell Fantasy. The Obverse is from the same die as Low 41. 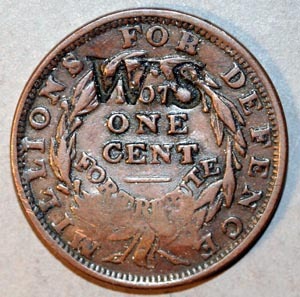 The reverse uses the same die as Low 41 with the wreath re-engraved, seven berries each outside and inside, and a short dash added below CENT. The Charles Litman Collection, PCAC sale #72, December 6, 2003, lot 39. 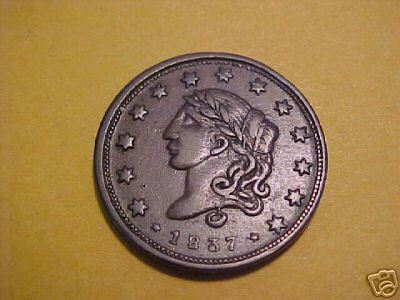 About Uncirculated with dark oxidized surfaces. Well struck in most areas. Some porosity as made. Very well struck and very attractive. Uniform chocolate brown toning overall. 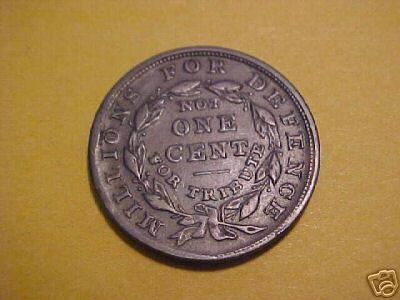 Liberty - Not One Cent. 1837. Copper. 28mm. "W.S." counterstamp on both obverse and reverse. The wreath has five berries inside, three outside (one opposite second E in DEFENCE). Choice brown uncirculated. Glossy and lustrous but very little cartwheel effect. Reddish tan and light brown with some iridescence. Needle sharp strike on both obverse and reverse. Brown and irridescent surfaces. Very well struck with georgeous tones of gold and green blending to brown. Uncirculated, with lightly oxidized surfaces. Stacks Ford: An extremely rare issue with only 5 auction appearances since 1958. The Charles Litman Collection, PCAC sale #72, December 6, 2003, lot 57. About Uncirculated with light oxidation throughout over a medium brown patina. On reverse, the C in DEFENCE is barely visible. Liberty Head with roses and leaves. Stacks Ford: Jjust as extremely rare as Low 70 with well under 10 pieces known. The Charles Litman Collection, PCAC sale #72, December 6, 2003, lot 58. Copyright � 2006 Alan S. Fisher. All rights reserved.